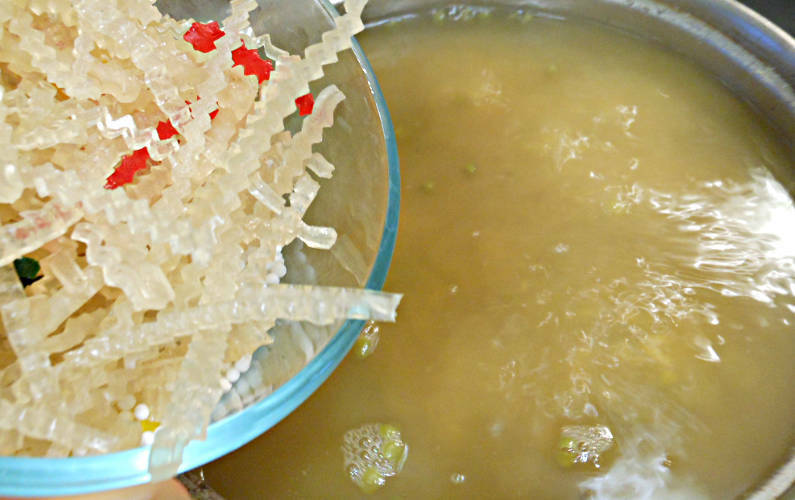 One of the classic desserts my mom always made for me growing up was a green mung bean dessert with tapioca pearls. In doing a recent reorganization of my kitchen, I found a bag of mung beans and pearls and the night before we had just made some coconut rice and had some leftover coconut cream so this was perfect, pretty much everything I need to make the dessert right at my fingertips. Prior to serving, taste to ensure it is at your preferred sweetness. Let it cook a bit more until incorporated. I prefer to eat the dessert warm but you do have the option to eat it cold as well. A classic Chinese dessert that always reminds me of home. Hope you enjoy it as much as I do! F8T Tip You could add taro too! Which restaurant desserts do you wish you could make at home? Nadia, it makes my mouth water! Yummy! One of my favorite desserts too!